For users who must log into a DotNetNuke website multiple times during the day, a faster login is desirable. The following module creates a cookie that recognizes the user and creates a link that logs the user in with a single click. Clicking the "Login" link will automatically log the user into the website. If you examine the browser cookies you will see that a cookie has been created. In the example below a cookie has been created for the "admin" user. The number placed in front of "_admin" is a random number that is stored in the DotNetNuke website for the user. If the number does not match the login will be denied and the cookie erased. The random number for the user in DotNetNuke settings will also be changed so that a brute force password guessing attack is not possible. Clicking "Clear Fast Login" will remove the cookie. 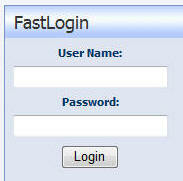 It is not recommended that you make the Fast Login module available to the public. 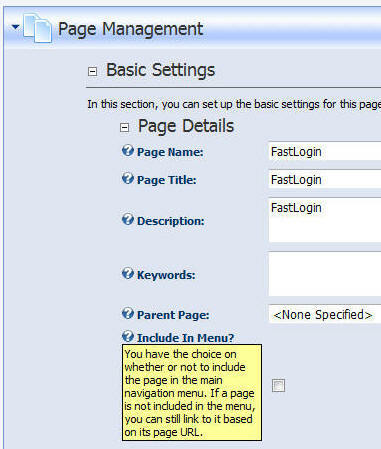 Place this module on a page (Tab) and then in Page Management, set the page to not display on the menu by un-checking the "Include In Menu?" option. The web browser will navigate to the page and you will then have the URL (web address) for the page to provide to your website administrators that you would like to provide fast login to.
' DEALINGS IN THE SOFTWARE. lblLoginError.Text = "incorrect username or password"
lblLoginError.Text = "incorrect check code for the cookie"